Nowadays Nearly 480 million Indian population are using the Internet every day. This became a boon for introducing of online stores in India. Online shopping is gradually increasing day by day in India. Now mostly each and everyone is preferring to buy the products online at their convenient. People are more addicted to online shopping. And this even made more demand for online shopping. 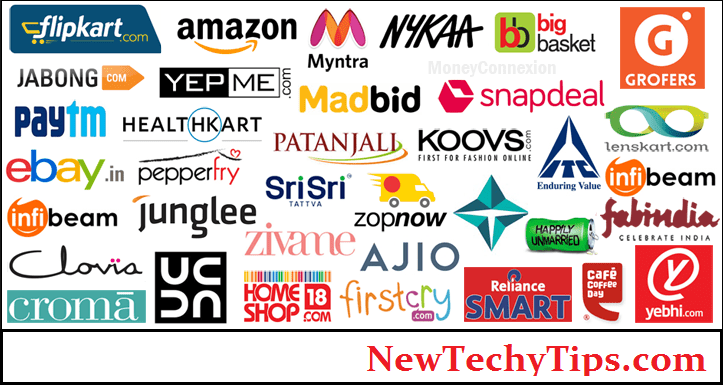 Let’s get into the best online shopping sites in India. Amazon is one of the best online shopping sites in India. It has a wide range of products available. Indians are mostly preferred for Amazon because of quality and genuine products. Indians are the second highest customers for Amazon when compared worldwide. That is why Amazon is establishing many warehouses in India. Recently Amazon introduced selling groceries online and succeded. A fastest and quick delivery of groceries at your doorstep. Exchange and return or refund process are a little bit late. Flipkart is also one of the best online shopping sites only in India. Which has a lot of consumers. There are millions of visitors visits this online store every day. Flipkart offers great discounts to their customers. By offering great discounts, it became one of the best online shopping sites in India. We can say that it has replaced the giant Amazon position and became the No.1 position in India. It has quick delivery service. Refunds and exchange process is very easy when compared with other online shopping sites. Flipkart is one of the best online shopping sites in india for cash on delivery. Paytm mall it is a Part of Paytm. Where Paytm firstly started just as a Mobile wallet like Recharge, Payments etc. By increasing demand for online shopping made even Paytm to step into online store Named Paytm Mall. In Paytm mall a wide range of products available like clothes, groceries, apparels etc. Paytm mall has introduced recently but it has secured a great place and now it is one of the top 10 online stores in India. Ebay is also one of the best e-commerce site available in India. It is operated worldwide. It has a wide range of products available. Ebay is mainly known for the low prices for the products when compared with other. Having of Low prices made the Ebay a great platform to buy till now. It is also having a great traffic worldwide. Myntra is an Indian best online shopping site in India for clothes. Myntra has a wide range of clothing available. Myntra has a wide category of clothing from Traditional to Modern and Myntra offers great discounts during the festive season and attracts more customers than Jabong. In may 2014 Myntra was acquired by Flipkart. Jabong is an Indian online shopping port. Which is one of the best online shopping site in India which is mainly focused on fashion. Jabong is a good choice for who prefer to buy clothing on online. Jabong to allows great discounts for its customers. Jabong was acquired by Flipkart in July 2016. Shopclues is also one of the online shopping portals in India. Which was established in July 2011. Shopclues is mainly known for discounts and offer a wide variety of products available. It also offers discounts during festival season and even in Normal season. Voonik is one of the best online shopping sites started in India in 2013. Voonik became a leading online shopping site mainly known for women fashion. Wide variety range of products available.A worldwide clothing styles available only for women in India. Voonik also offers discounts and cashback offers is a plus point for who shop in Voonik. Voonik products like women clothing, apparels, shoes. In simple words, it is called as a women fashion hub. Bigbasket is India’s best online shopping grocery store. Bigbasket was introduced in October 2011. Bigbasket is a boon for every individual who is very busy in their jobs or works. They can buy each and every item on big basket like groceries, spices, fresh fruits and vegetables, Beverages, fresh dairy products etc. Bigbasket has over 18000 products and nearly 1000 brands available. Bigbasket acquired a great position in the e-commerce industry. Bigbasket offers great discounts and additional 20% cash back on every transaction made through debit and credit card. In metro cities, the big basket has become the part of peoples life. In 2017-18 big basket is leading top 10 online shopping sites in India and it has 206 percent growth recorded. AJIO is a subsidiary company of Reliance group which is led by Mukesh Ambani. AJIO is a reliance on retail which is inaugurated in 2006. Reliance retail is like reliance Trends which is an offline store. But AJIO is a best online shopping site which has a superior value of customers and delivering high-quality brand to its customers. AJIO is a fashion hub where it has a wide variety of products like footwear, Clothes, electronic gadgets available for both men and women and kids. AJIO has international fashion brands. AJIO offers 35% off on purchase of above Rs 3000. Limeroad is an online shopping site for fashion and lifestyle. It has a wide variety number of brands available for both Men and Women in clothing, footwear etc. Lime road has a tough competition from AJIO, Jabong and Myntra. Limeroad is trying its best to place in the top 10 best online shopping sites in India. Limeroad has a reasonable price which made Limeroad achieve success. I hope you like this best online shopping sites in India article. If you have any other sites please mention in the comment section. I would love to hear your comments.